Collision repairers and insurers might encounter a new lighting trend in the coming years: Vehicles which project symbols on the ground for aesthetic or functional purposes. Mitsubishi Electric on Nov. 1 announced that its “Safe and Secure Lighting” system in development today should be deliverable for new cars starting in 2020. 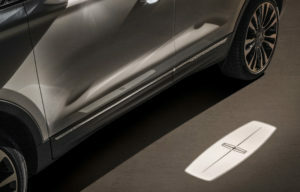 The suite displays illuminated alerts on the ground and vehicle — Mitsubishi showed off an signal in the rear windshield — to warn cars, pedestrians and cyclists to an imminent activity. Mitsubishi Electric offered one example in which lighting projections make it even more obvious that the vehicle is about to reverse. (In case the taillights weren’t clear enough.) In other display, a car signals that it’s about to open a door, something which ought to prevent clotheslining cyclists or getting a door torn off by a passing vehicle. Mitsubishi pointed out that such bold signals could be necessary to keep pedestrians and cyclists from being unfortunately surprised by the growing ranks of hybrid and electric vehicles, which can be extremely quiet. “But even vehicles with combustion engines pose a great risk to pedestrians and cyclists, especially considering the increase in people wearing headphones,” Mitsubishi Electric Automotive America engineering Vice President Mark Rakoski said in a statement. National Highway and Traffic Safety Administration data shows pedestrian and cyclist deaths in 2016 were at their highest since 1990 and 1991, respectively. 2015 data indicates 74 percent of pedestrian deaths occur at night. Rakoski also said such signals could be necessary for autonomous cars. Ford and Virginia Tech explored that concern in August, this time with a policelike light bar behind a Transit Connect’s windshield. The research was meant to determine how passersby reacted to various signals, with a possible eye toward developing a standard industrywide set of autonomous vehicle messages like turn signals today. Osram in January showed off an external system similar to Mitsubishi Electric’s on a Rinspeed concept car. Unlike Mitsubishi Electric, the Tier 1 supplier gave no confirmation it would be installing the tech on an actual vehicle. But it would also project a “luminous Lincoln welcome mat” next to both front doors.